My new book, Bystander, hits the shelves on Tuesday, September 29th, 2009. And that’s a strange thing for an author, because it’s an anticipated date but also anti-climactic. A smile followed by a shrug: Okay, so? What now? Allow me to dwell on the book a little bit before rushing off to the next thing. Consider it the blog equivalent to chilling the champagne before the cork is popped and the hangover drops. 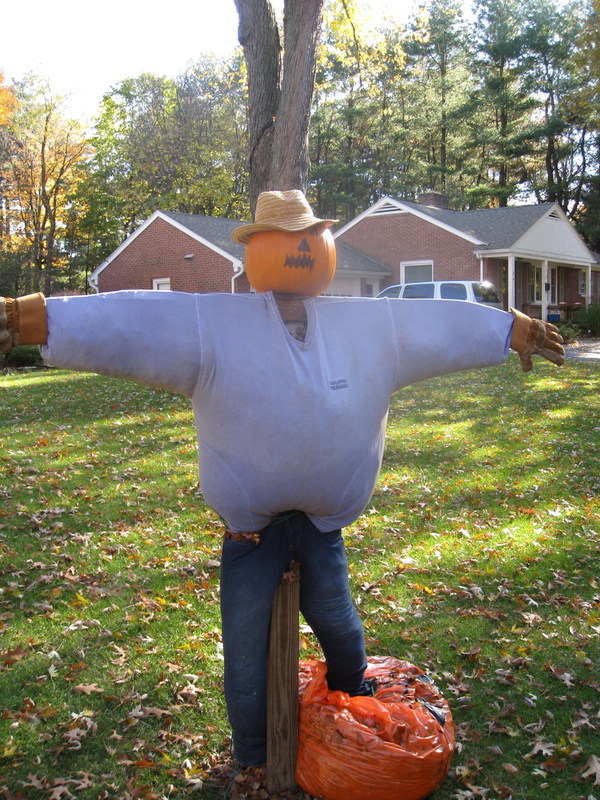 One of the pleasures that came with writing this book was the setting, my hometown roots of Long Island, New York. I grew up in Wantagh, “The Gateway to Jones Beach,” lived there all through high school, the same address, the same phone number. 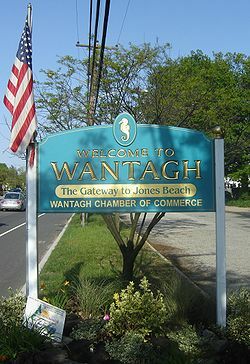 For Bystander, while thinking of Wantagh, I called the fictionalized town Bellport, combining the names of two nearby towns, Freeport and Bellmore. In the book, Eric drives with his mother along Wantagh Parkway, visits Jones Beach, walks the boardwalk, and even references a restaurant where I used to wash dishes. I’ll save those memories for another day, perhaps. 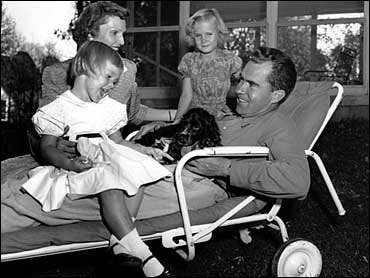 Because today I want to talk about President Richard Milhous Nixon’s black-and-white dog, Checkers. 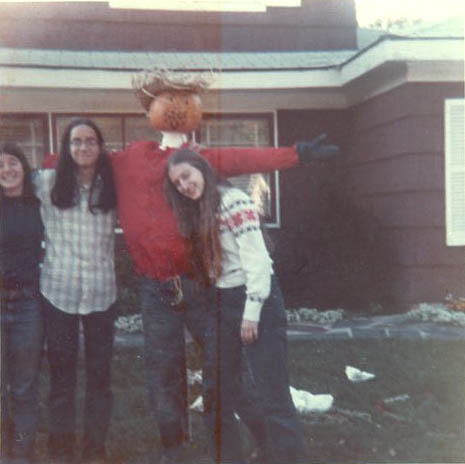 I attended Wantagh High School, 1976-79. Immediately across from the front parking lot was the Bide-A-Wee animal shelter and pet cemetery. 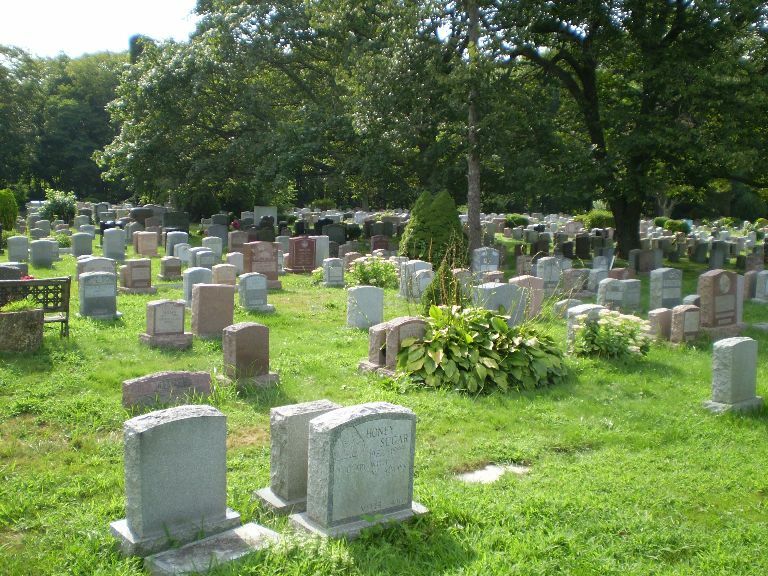 Famous, in its way, because according to legend it was the third largest pet cemetery in the United States. Nothing to sneeze at, that. Sure, it wasn’t one of the Seven Wonders of the World, but it represented our thin slice of fame nonetheless. And the slice grew even thicker, thanks to the fact that President Nixon’s famous dog, Checkers, was buried there. 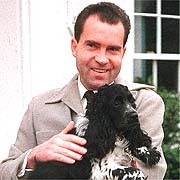 This dog was no mere pet, for it managed to play a key role in winning sympathy for Nixon in the hearts and minds of American voters. I am referring, of course, to the famous “Checkers Speech” of September 23, 1952 (see clip, below). A speech that any American history buff well knows, for it helped save Nixon’s political career. For a while, at least. By high school, I was aware of the circumstances of Nixon’s speech, its historical significance, and so thought it was pretty cool — in a total goof kind of way — that the aforementioned dog was buried nearby. From time to time, on breaks from the drudgery of classes, my friends and I might wander into the cemetery . . .
pass deep into the vast grounds . . . I remembered the grave usually had small American flags at each side, which my research confirmed, lending the site an odd sort of patriotic gravity. We remained suitably morose, lazing on the grass, killing time. I set a pivotal scene at this exact location, this specific and somewhat bizarre place from my youth. To set up the excerpt, let me explain that Eric is being led into the cemetery by David Hallenback, who wishes to show him something both private and important. They hopped a short fence and entered the grounds. Despite its proximity to the school, this was actually Eric’s first time inside the cemetery grounds. 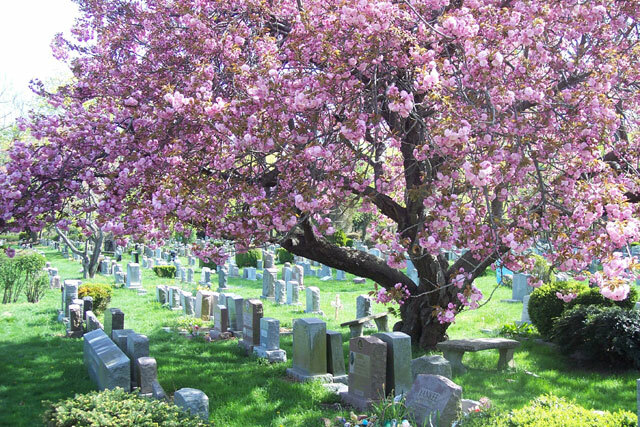 It wasn’t that creepy, the way a real cemetery –- a human cemetery –- could sometimes be. Eric couldn’t get too worked up about a dead Siamese cat. Still, he marveled at the size of some of the headstones. There were a few that were really huge. Most of the gravestones were modest in height, about thigh-high, but they were thick and looked heavy. They were light brown or gray, with a few shiny black ones sprinkled in. Each had the dog’s name engraved into it, complete with year of birth and death, and the last name of the owner. Eric thought it was kind of comical. It was a cemetery, and that’s serious stuff, but the names on the tombstones were, like, Sparky and Mugsy and Luther and Bubbles. A few had pictures of the (dead, buried, rotting) pet, and there were even little statues of dogs and cats at some of the grave sites. Eric noticed fresh flowers at a couple of sites and that gave him a chill, the thought of some lady weeping at a grave site over poor old Mr. Chuckles, the world’s perkiest Yorkshire Terrier. That was sooo his father. Mr. Half Empty. “I wish I had a dog,” Eric said. Hallenback remained quiet, distant. He hadn’t said a word since they entered the cemetery. Something on his mind, Eric surmised. 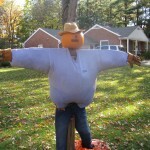 When they neared the far corner, Hallenback steered them to a low, granite tombstone. Several small American flags –- the type that kids wave at Fourth of July parades –- were planted in the ground at each side of the site. 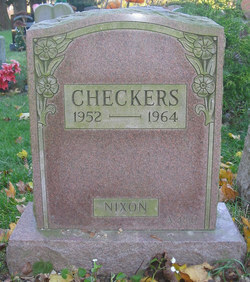 The tombstone read: CHECKERS, 1951-62, NIXON. Hallenback appeared distracted, not listening. He was looking off in the other direction. A group of five boys emerged from the far side of the cemetery. Eric knew each one of them. They were led by Griffin, with Cody at his side. By the look on their faces, Eric could see they meant trouble. Hallenback was going to get creamed. One other thing I probably should tell you, because if I don’t they will probably be saying this about me, too. We did get something, a gift, after the election. A man down in Texas heard Pat on the radio mention the fact that our two youngsters would like to have a dog, and, believe it or not, the day before we left on this campaign trip we got a message from Union Station in Baltimore, saying they had a package for us. We went down to get it. You know what it was? It was a little cocker spaniel dog, in a crate that he had sent all the way from Texas, black and white, spotted, and our little girl Tricia, the six year old, named it Checkers. And you know, the kids, like all kids, loved the dog, and I just want to say this, right now, that regardless of what they say about it, we are going to keep it.